1. Clean and soak rice in warm salted water for 30 minutes. In a small bowl add mixed spice, salt, pepper, cardamom, cloves, coriander and cinnamon. Marinate meat in spices, set aside. 2. In a large sauté pan on medium heat add oil. Add onions and garlic cooking until golden. Add spiced meat, stirring. Add grated carrots, shaiba leaves, tomatoes, tomato paste, bay leaves and cinnamon, stirring well. Add water, stir. Raise heat to high and allow mixture to come to a full boil then reduce heat to low. Cook for 30 minutes. Removes shaiba and bay leaves. 3. Add rice and raisins to mixture making sure rice is covered with broth, add more water if needed. Raise to high heat until a full boil, cover and simmer on low heat until rice is cooked about 25 minutes (do not open the lid what so ever). In a small pan add 2 tablespoons olive oil, carrots and nuts; cook 5 minutes on medium heat. 4. 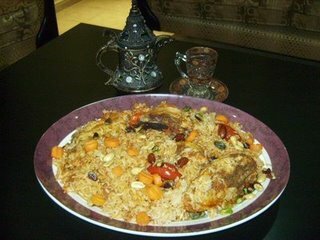 Places rice and meat in a serving dish, arrange sliced carrots and fried nuts on the top of the mixture. oh that sounds and looks yummy masha'Allah. Jzakillahu khayr for sharing that recipe. I will be sure to try this also insha'Allah.